Today's visit to URJ Crane Lake Camp was exciting for the supervisors from Berkshire Hills Emanuel Camp, who had each worked at BHE for 3-5 years. As they toured the camp, learned about the program, and spoke with Crane Lake's counselors and supervisors, they identified several useful ideas to bring back home. One of the most fascinating parts was the Crane Lake seems to be a large camp (in enrollment numbers) with the attitude of a small camp, and the feeling of an intimate family. 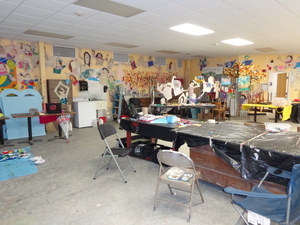 Crane Lake had many exciting facilities, like this newly-built art room (above photo) of considerable size, and a zoo with pigs, dogs, llamas, and even a pony. But even more importantly, their program philosophy is incredibly strong - Crane Lake seems to be exceedingly conscious of the vocabulary and framing that it uses. For example, instead of "homesickness," campers simply "feel sad" sometimes, which is a natural feeling, and much easier to address. My favorite example is the chart of Crane Lake's organizational structure. Rather than top-down supervision, Crane Lake sees its staff as a wagon wheel, with the year-round staff around the edges, and the campers and families at the center. In between, the senior staff are grouped into "teams" by program area, where they discuss and strategize about issues, rather than simply taking direction from a superior. While many camps operate this way, it's cool to visually illustrate that philosophy on a circular pie chart. 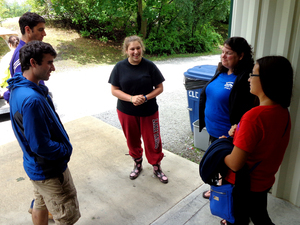 During their visit, the group from Berkshire Hills Emanuel talked to this counselor, who is in her first year of the Olim Fellowship. 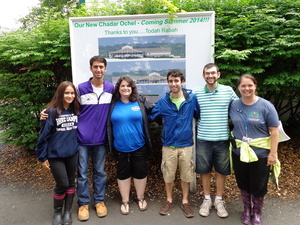 Formed as a partnership between two URJ camps, and since expanded to five, the fellowship provided advanced training for first-time counselors who commit to working for two years at camp. In addition to at-camp development, the fellows all gather together for multiple seminars during the year, where they learn about their own identity, as well as best practices for camper management and group facilitation. 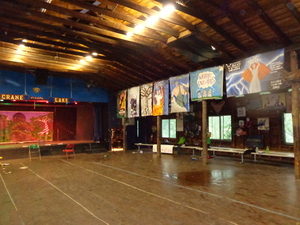 Crane Lake has a long history, though it has only been a URJ camp since 1998. Still, many traditions (like the color war posters above) date from long before then. It's exciting to see how Crane Lake's program has evolved over those years, and the new leadership is actively moving Crane Lake forward on many fronts!